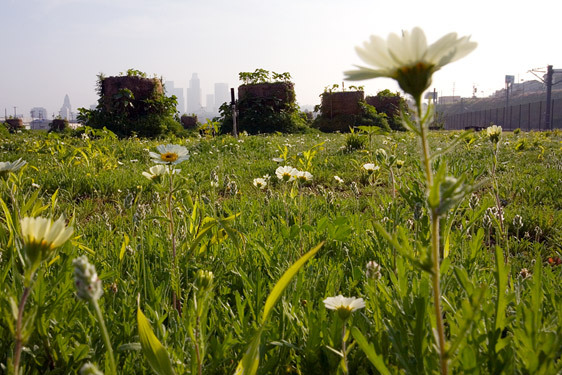 Welcome to the official web site for the Not A Cornfield project, a transformation of a 32 acre industrial brownfield in the historic center of Los Angeles into a cornfield for one agricultural cycle. This temporary project is located just North of Chinatown and South of Lincoln Heights on a large stretch of land well known as “The Cornfield." The Cornhenge monument continues to aerobically decompose and regenerate in the form of marigolds, daffodills, sage, and sunflowers, among other native plants. See more photos of the sprouting Cornhenge monument. The Not A Cornfield project team has moved across the street into our new office/studio. See photos of State Parks' progress on their interim park. State Parks once again controls access to the Cornfield. Read more about the Clear phase . Read entries in the blog. Subscribe to the Not A Cornfield podcast, featuring a two-hour documentary from Radiosonideros. More on the BLUE PHASE and the GOLD PHASE. LA Artist Lauren Bon has created this sculpture with funds from the Annenberg Foundation. Ms. Bon is a trustee of the Annenberg Foundation and President of Not A Cornfield, LLC. As a funder of Not A Cornfield, the Annenberg Foundation continues its long-standing support of projects that serve communities through education, civic, health, and artistic initiatives and programs. 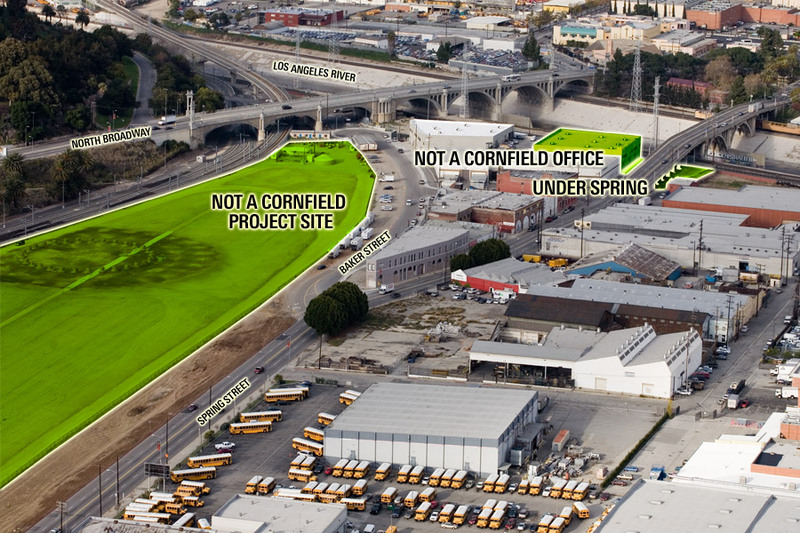 The Not A Cornfield project will be enacted on the site of the future Los Angeles State Historic Park.